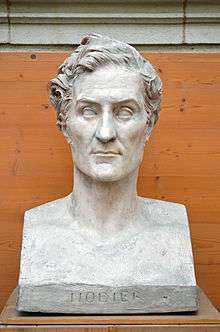 The twenty years at the Arsenal were the most important and fruitful of Nodier's career. He had the advantage of a settled home in which to collect and study rare and unusual books; and he was able to establish a celebrated literary salon, known as Le Cénacle, rallying a knot of young literary men to romanticism (the so-called Romanticists of 1830), some of whom would achieve great renown themselves. Victor Hugo, Alfred de Musset and Sainte-Beuve all acknowledged their obligations to him, and Alexander Dumas incorporated his recollections of Nodier into his novelette La Dame au Collier de Velours. The group included Alphonse de Lamartine and Gérard de Nerval. Nodier was a passionate admirer of Goethe, Laurence Sterne and Shakespeare, and himself contributed to the literature that was one of the leading traits of the Romantic school. His best and most characteristic work, which is exquisite in its kind, consists partly of short tales of a more or less fantastic character, partly of nondescript articles, half bibliographic, half narrative, the nearest analogue to which in English is to be found in some of the papers of Thomas De Quincey. The best examples of the latter are to be found in the volume entitled Mélanges tirés d'une petite bibliothèque, published in 1829 and afterwards continued. Of his tales the best are Infernaliana (1822); Smarra, ou les démons de la nuit (1821); Trilby, ou le lutin d'Argail (1822); Histoire du roi de Bohême et de ses sept châteaux (1830); La Fée aux miettes (1832); Inès de las Sierras (1837); Les quatre talismans et la légende de soeur Béatrix (1838), together with some fairy stories published in the year of his death, and Franciscus Columna, which appeared after it. The Souvenirs de jeunesse (1832) are interesting but untrustworthy, and the Dictionnaire universel de la langue française (1823), which, in the days before Littré, was one of the most useful of its kind, is said to have been not wholly or mainly Nodier's. There was a so-called collection of Œuvres complêtes published in 12 vols. in 1832, but at that time much of the author's best work had not yet appeared, and it included but a part of what was previously published. Nodier found an indulgent biographer in Prosper Mérimée on the occasion of the younger man's admission to the academy. During the 1820s, after adapting Dr. John William Polidori's short story "The Vampyre" successfully for the stage in France (Le Vampire, 1820), Nodier involved himself in the theatre for a few years. Among these works were Bertram ou le Pirate (1822), based on a play by Charles Maturin in England (Bertam, or The Castle of St. Aldobrand), and Le Monstre et le Magicien (1826), which adapted an English play based on Mary Shelley's novel Frankenstein. 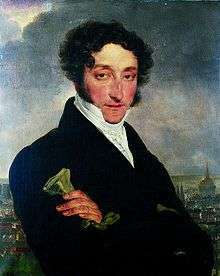 Nodier also translated and adapted an Italian play by Carmillo Frederici (Le Delateur-The Informer) in 1821. Despite the success of these works, he lost interest in the theatre, and by the late eighteen twenties devoted himself entirely to literature, mostly to the conte fantastique. An account of his share in the Romantic movement is to be found in Georg Brandes's Main Currents in Nineteenth Century Literature. Nodier's Description raisonnée d'une jolie collection de livres (1844), which is a catalogue of the books in his library, contains a life by Francis Wey and a complete bibliography of his numerous works. See also Sainte-Beuve, Portraits littéraires, vol. ii. ; Prosper Mérimée, Portraits historiques et littéraires (1874); and A Estignard, Correspondance inédite de Charles Nodier, 1796–1844 (1876), containing his letters to his childhood friend and fellow enthusiast in literature, Charles Weiss. The libretto of John Barnett's 1834 opera The Mountain Sylph is also adapted from Trilby, via the ballet La Sylphide. Le Vampire (1820) - (The Vampire) - an atmospheric full-length theatrical play, freely adapting the story of John William Polidori. Souvenirs de Jeunesse (1832) - (Souvenirs of Youth) - a collection of novellas comprising "Séraphine", "Clémentine", "Amélie", and "Lucréce et Jeannette". Subsequent editions included "Thérèse". Dedicated to Alphonse de Lamartine. Inès de Las Sierras (1837) - a gothic novella. Alexandre Dumas complained to the author about the rationalization of this story at its end. This is recorded in Dumas' novella La Femme au Collier de Velours, which begins with a personal portrait and some reminiscences of Charles Nodier and the Cėnacle. Les Quatre Talismans, et La Légende de Sœur Beatrix (1838) - two 'contes fantastiques,' a short novel and a short novella, the latter composed of Christian imagery. Dictionnaire Raisonné des Onomatopées Françaises (1808) - (Reasoned Dictionary of French Onomatopoeia) - a dictionary of words derived from the sound associated with the subject (e.g. Cuckoo). A high point of the author's early years which was somewhat expanded in a new edition of the book in 1828. Promenade de Dieppe aux Montagnes de l’Écosse (1821) - a book describing Nodier's travels through Britain including Scotland. His experience of the Scottish landscape inspired two of his best known works: Trilby and La Fée aux Miettes, which were set in Scotland. Du Fantastique en Littérature (1830) - a full-length study of the weird or fantastic in literature. La Seine et ses Bords (1836-1837) - (The Seine and its banks) - a full-length description of the river and the geography of its banks. Illustrated by Marville and Foussereau. Lord Ruthwen, ou Les Vampires (1820) – a rambling vampire novel based on earlier sources, a description of which is given at the end of the book. The overall theme is in the form of a sequel to Dr. John William Polidori's short story "The Vampyre", and the material suggests that it may originally have been intended as a play. The title page of the first edition attributed publishing to the author of Jean Sbogar and authorship to the pseudonym "C. B. ", causing historians to speculate that the book was written by a contemporary vaudeville manager named Cyprien Bérard, with whom Nodier was associated. The sources for the stories suggest the knowledge of a librarian and a bibliophile, and the novel misspells the name Ruthven as occurred in the text of Promenade de Dieppe aux Montagnes de l'Écosse. There are features of Nodier's Jean Sbogar and Les Tristes in the novel, but the writing is hurried and lacks the quality of Nodier's other fictional works. ↑ "The Painter of Salzburg, journal of the emotions of a suffering heart, followed by Meditations on the Cloister". ↑ Dahan, Charles Nodier ; édition établie, présentée et annotée par Jacques-Remi (1995). Correspondance de jeunesse. Genève: Droz. p. 331. ISBN 2600000690. ↑ Juvan, Andreja (2003). "Charles Nodier in Ilirija" [Charles Nodier and Illyria]. Kronika: časopis za slovensko krajevno zgodovino (in Slovenian). Section for the History of Places, Union of Historical Societies of Slovenia. 51 (2): 179. ISSN 0023-4923. 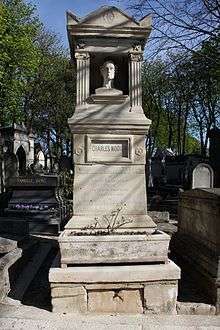 ↑ "Charles Nodier (1780–1844)". Ilirske Province / Provinces Illyriennes [Illyrian Provinces] (PDF) (in Slovenian and French). Government Communication Office, Republic of Slovenia. 9 May 2009. p. 6. Porée, Adolphe-André (1903). Note sur Auguste Le Prévost et Charles Nodier (in French). Rouen: L. Gy.